Below you can view all the homes for sale in the Clayton subdivision located in Denver Colorado. Listings in Clayton are updated daily from data we receive from the Denver multiple listing service. To learn more about any of these homes or to receive custom notifications when a new property is listed for sale in Clayton, give us a call at 720-729-2320. The small fenced yard with storage shed, with electrical, is perfect for animals and entertaining. MLS#9935455. Allen & Associates Properties. Backyard is fenced with patio area. 2 Car Detached garage. MLS#5553018. Colorado Home Realty. ***Buy Lot to north: 4,613 sq.ft same U-SU-B1 @ $175k! MLS#2262971. CJV Real Estate. Two car attached garage with storage loft. MLS#9172003. Equity Colorado. Don't miss this one, it truly sets itself apart! MLS#6840760. Your Castle Realty LLC. Easy access to downtown and I-70. MLS#2253186. Conscious Real Estate. This is the best of Denver’s urban lifestyle! MLS#7251776. Housing Helpers of Colorado LLC. Many new neighborhood amenities are in the area and many are soon to come, they include park hill golf course, a new beer garden, Denver Rock Drill and planned greenbelt with walking trail. Potential to SAVE $$$ w/this purchase! MLS#9800215. Keller Williams Realty Urban Elite. Situated on a quiet street, this light, bright, move-in-ready bungalow has an updated kitchen, two-car detached garage, original pine floors and an updated main floor bath—just three blocks to Park Hill Golf Course and centrally located for easy access to downtown and DIA. Enjoy! MLS#2128679. Porchlight Real Estate Group. 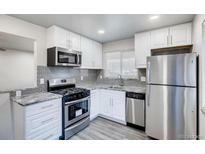 Walk 3 blocks to City of Nairobi Park, 4 blocks to Prodigy Coffee House, QDoba, and Starbucks and restaurants and a couple blocks to Park Hill Golf Course. Don't miss this one! MLS#5930130. Your Castle Real Estate Inc.
Minutes from downtown and with easy access to I-70 & the light rail. MLS#5986720. Redfin Corporation. Two car attached garage with storage loft. MLS#3108071. Equity Colorado. This one won't last long..set your showing today! ! MLS#4754175. HomeSmart Cherry Creek Properties. New carpet and kitchen appliances installed March '19. Showings begin 3/21/19. MLS#6174623. Keller Williams Realty Downtown LLC.